Dia de La Muerta XI Festival & Bottle Release at our S Presa brewery. We are going to a festival format this year (which means no more bottle share), and have lined up a killer list of Texas brewers bringing their best (many of whom don’t distribute to San Antonio normally): Austin Beerworks, Celis, The Collective Brewing Project, Eureka Heights, Hops & Grain, Jester King, Pinthouse Pizza, Real Ale, Redhorn, Saint Arnold, Spindletap & St. Elmo. We will release a beer list in mid-October. VIP SESSION, NOON-1p, Limit 100: The VIP session will feature an extra hour, specialty beers only available during the VIP, a bottle of Balcones Baby Blue Barrel Aged La Muerta (the only way to get this bottle), a bottle of regular La Muerta 2018, and 6 pour tickets for use during the General Session. GA TICKET, 1p-5p: Includes a bottle of regular La Muerta 2018 and 6 pour tickets. 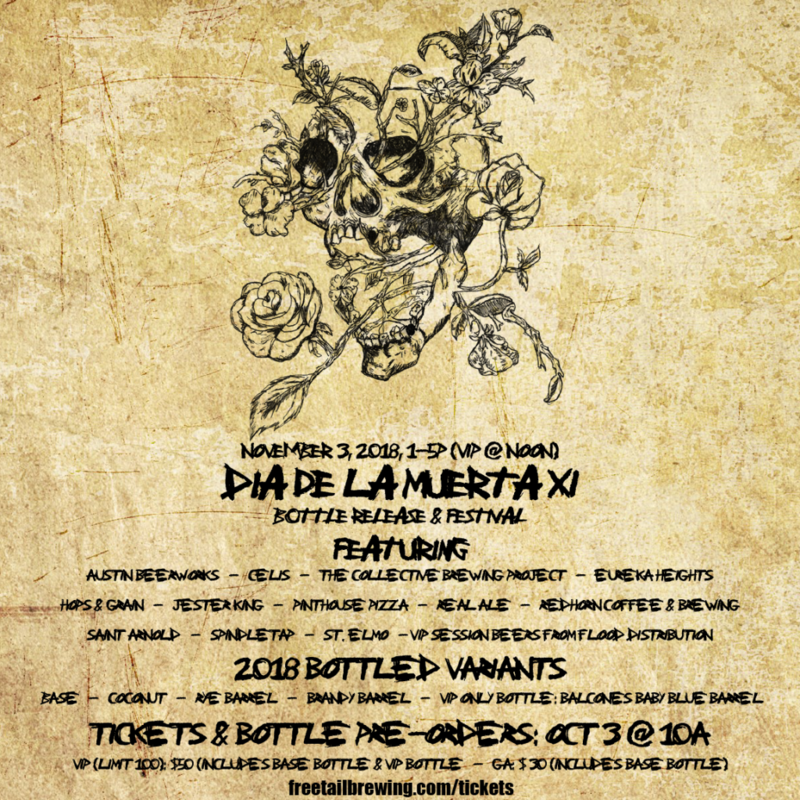 BOTTLES PRE-ORDER: Whether or not you are attending the festival, you will have an opportunity to pre-order your bottles this year for pickup on Dia de La Muerta through November 28. Note: we will be holding back a small allocation of each variant (except for Balcones Baby Blue) for release after Dia de La Muerta. Pre-ordering bottles is a guaranteed way to make sure you get the bottles you want though. DESIGNATED DRIVER TICKET. We will offer free non-alcoholic beverages to designated drivers during the event. DDs will NOT be permitted to purchase alcohol during the event, and a DD ticket holder must be with a VIP or GA ticket holder. DD ticket holders WILL be allowed to pick up any bottle pre-orders they may have made. We will have a tapwall full of draft only La Muerta variants and other Freetail rarities. Each participating brewer will be bringing anywhere from 2 to 5 beers. We have asked that any brewer who distributes to San Antonio already to bring their absolute best. Breweries who do not normally distribute to San Antonio may be bringing some of their flagships, since they will be new to us. Festival goers will be given 6 pour tickets, with more available for sale at the Festival. The S Presa taproom will be closed to all other traffic on this day. Only festival attendees and those picking up bottles will be admitted. You will not need to print out your ticket at home and bring it. We will have a list of attendees at the door. Prices above do not include sales tax or Eventbrite fees. However, to accomodate Eventbrite fees the prices above reflect a $1 discount versus what we will ultimately sell them for at the brewpub or tasting room. No cash bottle sales will take place the day of the Festival. Any tickets not sold during the pre-sale will be added back to the allotment we are holding back to release at our brewpub or tasting room. You will have until November 28 to pick up your bottles from our S Presa tasting room. If you do not pick them up by November 28, your bottles will be added back to our inventory and you will lose your claim to them with no refunds issued. Bottle pick up will be during our Dia de La Muerta festival in the loading dock. The S Presa tasting room will NOT be open during the festival. You may request a refund up to 1 day before the release. No returns or exchanges will be made after the event and bottle pickup. Purchases abandoned at the brewery after the pickup window closes will be immediately resold, all claims will be forfeited with no refund.